I’ve been plotting this blog for several months now. I started heavily researching back in December, trying to figure out exactly what I wanted this to be. At first, I wanted to avoid chains as much as possible. Then I started to realize that even with traveling, that’s where people end up due to convenience or because they know that’s where they can find something that will agree with their digestive system. While I won’t completely exclude them, I also won’t focus on them either. The big golden and brown logo beckons you from billboards and signs dotted down the highway. Although it’s in 42 states (a fact I just learned), many people associate Cracker Barrel with the South. It’s hard to resist their combination old general store and traditional Southern food. 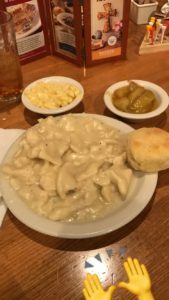 I rarely even look at the menu because I always go with my standard Chicken N’ Dumplins Platter with Macaroni N’ Cheese and Fried Apples. Let’s not forget the biscuits and sweet tea to complete this delicious meal. I was surprised to learn that Cracker Barrel has a special menu if you ask for it. 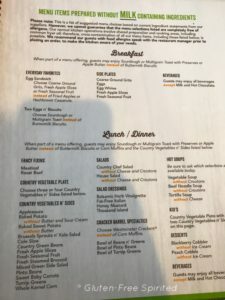 My dad asked if they had a gluten-free menu for my sister. 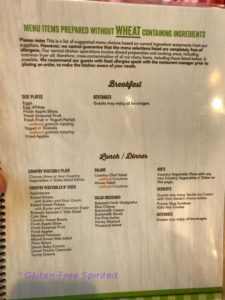 Our waitress retrieved a laminated spiral-bound menu from her manager. There is a specific section for gluten-free items, but it’s actually a Nutritional Information Guide. 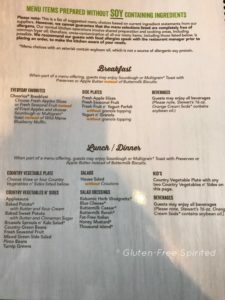 Celiac-Diease.com has info from 2009 and No Gluten has menu items as of 2016. 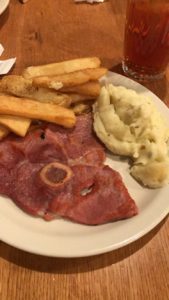 My sister opted for the Hickory Smoked Ham, mashed potatoes, and fries. She knows this is double carbs, but she was picking options she felt would be safe. Nikki warns that the hickory smoked ham was salty like a country ham would be. She did like it though. Immediately after dinner was over, her stomach began hurting. She suspects it was the mashed potatoes and cautions anyone with dietary concerns when ordering them to ask if they have dairy in them or skip them altogether. This is why she’s a meal tester, folks. **UPDATE: Last weekend, we made another trip to Cracker Barrel. Nikki asked for the gluten-free menu and she was brought an updated menu. 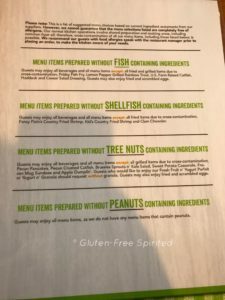 They now have sections for menu items that are wheat-free, soy-free, fish-free, shellfish-free, tree nut-free, peanuts-free, and egg-free. Each section is broken down into breakfast, lunch, and dinner items. Apologies for the glares/shadows on the pictures. 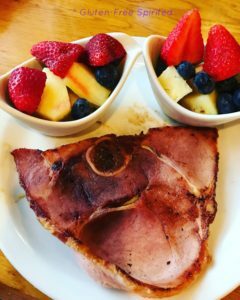 Gluten-, soy-, & dairy-free meal: sugar-cured ham and double order of fresh fruits. Those of you with dietary restrictions, do you avoid Cracker Barrel altogether or do you still eat there? What’s your go to order? 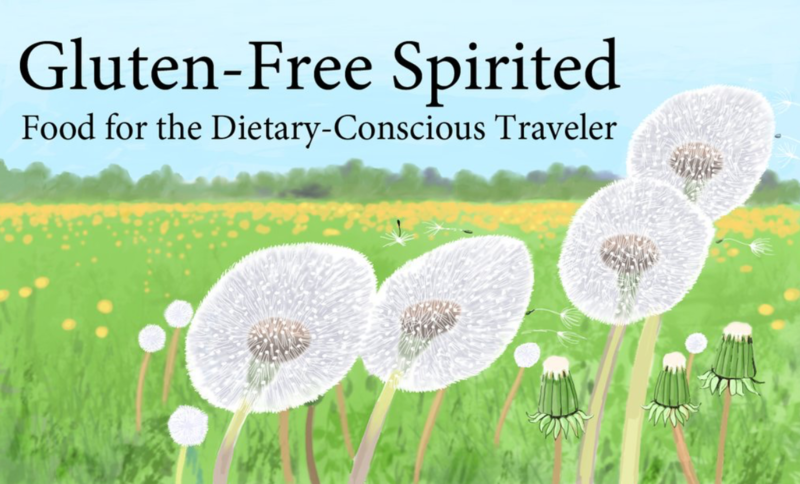 Do you have any recommendations for any of our other dietary conscious travelers? If you found this helpful, you might also find these useful too: what to order at Golden Corral and Smashburger. Get social with GFS. Don’t forget to subscribe so that you don’t miss anything! Thanks for the info, Laura. Luckily, my sister doesn’t have an allergy. She has food sensitivities related to IBS. She can’t have mashed potatoes because they use milk (she is gluten-, dairy-, & soy-free). I recommend that anyone with a food allergy should always call ahead no matter where they’re going.